For you who want to play role-playing game with ancient martial art, Age of Wushu Dynasty APK 5.0.5 is the best option. This game allows you to develop the character with certain skill set. It is going to help you mastering ancient martial art. The role-playing game that is developed by Snail Games USA Inc. offers high-resolution graphic. Most reviews related to this game mention that the graphic of the virtual world is stunning. You can enjoy the beauty of vivid ancient world in this game. The crowded city street, peaceful ambiance and challenging battlefield are comparable with PC game graphic level. The environment and places on this game is reimaged from authentic locations. 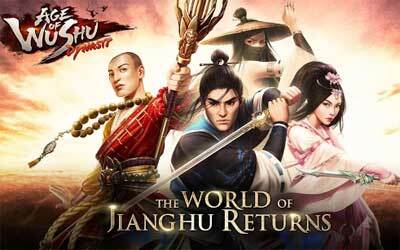 This game is going to bring the player into the city of Jiangshu. At that period, the Ming Emperor is looking for the best master of martial arts. In order to fulfill his request, you need to choose one of five martial art school. New “Find Resources” function added to get rewards for some of yesterday’s uncompleted events.